Connecticut State Employee Wellness Program Wins by Losing « They Said What? If you are just joining us from the NYT this morning (10/24) also see how a wellness vendor made Boise School District employees sicker...and then lied about it. The Connecticut state employee wellness program is so bad that I am embarrassed even to live in a bordering state. They lose money, harm employees, and brag about it. Let’s briefly review the history of the wellness industry. First, wellness was good because it saves money. Once we blew up that claim, the wellness industry started saying “Forget about ROI. It’s all about VOI.” But it turns out that VOI is negative, according to both the Health Enhancement Research Organization (which lists 11 types of indirect costs of wellness) and the American Journal of Health Promotion (which admits that employees have to use 4% of their work week to exercise in order for productivity to increase 1%). Checkups are included in Choosing Wisely’s compendium of low-value services. Along with Choosing Wisely (a joint venture of Consumer Reports and the American Board of Internal Medicine), there’s the New England Journal of Medicine and the Journal of the American Medical Association. The Choosing Wisely guideline is copied-and-pasted at the end of this post. Choosing Wisely lists many good reasons to go to the doctor. Being fined if you don’t, as happens to Connecticut employees, is not among those good reasons. No wonder increased spending “isn’t surprising,” Mr. Lembo. You’re sending employees to get useless checkups under duress. What did you think was going to happen? It could be worse. A lot of programs require checkups annually. Connecticut’s program requires them less often under age 50. The other low-value service: mammography for young women. The US Preventive Services Task Force suggests that mammograms start at age 50, but that women in their 40s might possibly consider them. Connecticut requires one before age 39. This is pure harm. Ironically, the state does not require them in one’s 50s, where they might actually be helpful. It’s been definitively established that getting routine mammograms in one’s 30s is a bad idea. The false positives and risk of radiation exposure (trivial on one person but the state is ordering x-rays on thousands of people) overwhelm the likelihood of an “early detection” of a meaningful tumor, while creating a noticeable likelihood of finding a “suspicious” but ultimately inconsequential lump that then has to be followed up for no reason. The books Overdiagnosed and Seeking Sickness: Medical Screening and the Misguided Hunt for Disease might be good reading for Mr. Lembo. 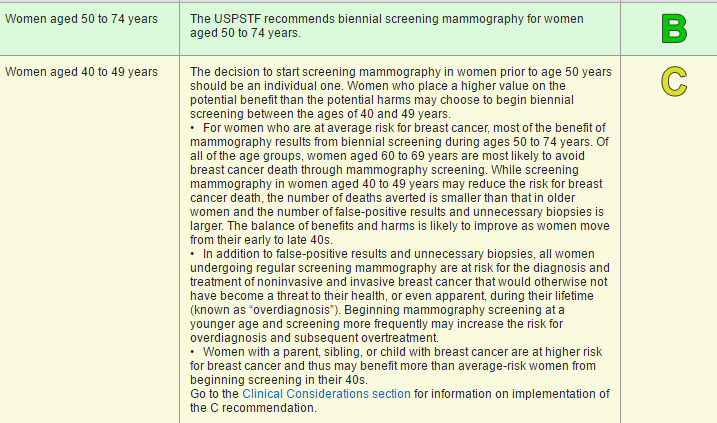 Unless someone is at high genetic/family history risk (in which case the mammogram wouldn’t be classified as a “screen”), mammograms in one’s 30s are so inadvisable that the USPSTF doesn’t even bother to recommend against them, because it never ever occurred to the USPSTF that anyone would advise them, let alone require them. And yet, Connecticut does. If you don’t believe anyone could come up with such a dumb idea, the screenshots — the state “prevention” schedule and USPSTF screenshot — are at the bottom of this column. Oh, and Connecticut employees who value their health enough to want to actually follow guidelines– meaning not subject themselves to harmful overdiagnosis and overtreatment–could be penalized up to $1200/year. Fortunately, doctors are allowed to formally exempt people from this requirement if they ask nicely. However, people who don’t ask are in trouble: doctors often find it easier to simply order a mammogram when asked than to try to explain why it’s a bad idea. And the whole concept of overdiagnosis and false positives is a tough one to communicate in a 12-minute office visit. That’s why we have Quizzify, of course. But the state of Connecticut doesn’t use it. Connecticut is a perfect example of why Quizzify isn’t already in the Fortune 500: We are advising employees to avoid low-value services, but the marketplace is much more receptive to a message of embracing low-value services. It’s amazing the outcome was as negative as it was, considering that the authors of the Health Affairs study, have that exact agenda: embracing low-value services. Mr. Hirth runs the Value Based Insurance Design Center, whose whole purpose is to implement this type of overdiagnosis/overtreatment program, notwithstanding all the evidence to the contrary. The authors noted ER visits dropped 10%, but didn’t fully attribute the drop to the extra low-value services employees were required to get. Maybe, they allowed, the drop might possibly be attributable to the state instituting its first-ever actual co-pay ($35) for ER services. Holy Economics 101, Batman! “People are taking their medications rather than going to the emergency room.” Yes, at great expense they waived a ton of co-pays for everyone…and got about 1%-2% more people to fill prescriptions. I haven’t done the exact math and neither did the authors, but I suspect each extra bottle of pills probably cost taxpayers about $1000 in waived co-pays for the other 98%-99% that would have been filled anyway. And it’s not quite clear how 1% more people taking pills creates a 10% drop in ER visits. They make references to “improved health and productivity,” without measuring it. I know when I come back to the office after getting a useless screen that shows a false positive, the first thing on my mind is increasing my productivity. They redefine these low-value services like checkups as “high value services”. Where Does Connecticut Go from Here? As a first step, Mr. Lembo would be well advised to hook his computer up to the internet. Once he realizes he has been snookered by his consultants, there is a way out: he can work with his union counterpart to dismantle the low-value portion of this program and share the savings between labor and taxpayers. Because in fact there is a surefire way to get an ROI on a wellness program: Get rid of it. By whynobodybelievesthenumbers in Uncategorized on April 14, 2016 .